Earlier this week we reported that Monster Hunter 4 had surged to number one in the Japanese charts, selling an outstanding 1,715,060 units at physical retail in just two days. Those figures were impressive, but Media Create has estimated that the latest release may have enjoyed the biggest-selling debut in the series' history. The honour has belonged to Monster Hunter Portable 3rd on PSP, which sold 1.951 million units in its opening week — over five days as opposed to the two days enjoyed by Monster Hunter 4 — but estimates of download sales may take the latest entry past that total. It's been reported that retailers sold around 155,000 download card for Monster Hunter 4, and it's estimated that roughly 100,000 further copies have been sold directly on the eShop, taking its loose total to around 1.97 million sales, creeping past the PSP title's debut with three less days on the market. These figures are further proof, not that it was needed, that Monster Hunter 4 has enjoyed an outstanding start in Japan. Even accounting for a steep drop after its hotly anticipated debut, Capcom's target of 2.8 million sales before 31st March 2014 is looking like a fairly safe bet, while this strong performance shouldn't do any harm to Nintendo's chances of retaining further support for future releases in the franchise. In case you didn't pick up the news previously, meanwhile, Monster Hunter 3 Ultimate is half price in North America and Europe until early morning on 22nd September — both the Wii U and 3DS versions are discounted on their respective eShop platforms. The Tokyo Game Show also closes on the same day, and if a localisation announcement were to follow the end of the sale we would absolutely lose our composure. Even if that doesn't happen, we like to dream. noww..... bring this to the states! Just bought MH3U... But if they do localize it this year I'd rip my hairs off of both excitement and frustration. Expect Capcom to say that it will be download only in the West very shortly. Come on Capcom, I know you can release this here 1 year after 3U was released. Good on Capcom, I hope they work on MH4G and have a simultaneous worldwide release for it. More monster hunter isn't a bad thing. I would say based on gameplay vids that MH3U is better for new players. This bodes well for future localization of this title. Capcom have been thinking on bringing mh to Nintendo handheld since the DS but the console wasn't strong enough now that the 3ds is a very capable handheld they are bathing in money. localization is a sure thing, i'd say easter is a likely release window. @JuanitoShet If only they could replicate its success in the west. It sells that much for a good reason. Getting this game on the 3DS is one of the best moves Iwata has done so far. CAPCOM: Attention everyone! We will be bringing Monster Hunter 4 to North America this holiday season. Furthermore, we have developed a Wii U version to coincide with the 3DS version, and the two will feature cross-play capabilities and in-game chat. ...Can't wait for this to come over, would love to experience more old monsters. @MadAussieBloke I'm with you on this one. Can't stand GTA or its clones. Def would lose my everything over a localization announcement. I needs me some MonHun 4 Deviljho Rajang Rage hunting here. Yeah, bring it to EU also. But wait until next year, I´m at 350 hours now and still at the G-Rank in MH3U. The PSP game could also have a lot of digital sales in the first week though. Anyway I look forward to Monster Hunter 4 although I may have to use circle pad pro. In the third game it seemed almost essential to me. I admit, I'm a MH noob. The half-price MH3 this week swayed me to purchase it, but I won't be starting the game until after I'm done with WWHD. 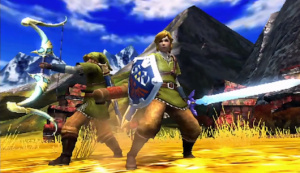 I absolutely loved playing Monster Hunter 3 Ultimate so I can't wait for Monster Hunter 4 to get released in the west. It will most likely be next year though. That's both a good and a bad thing. If it doesn't meet these sales expectations, then they could lose money, but it means the game will be more polished. Can't wait for it to get here. Now I got to play more of MHU3. I decided to mh3u 3ds because it was on sale, What have I been missing out on! @ajcismo good stuff! Just take your time and pace yourself. It is a bit slow starting but when you get to your first large monster you will be in for a helluva time. Personally I love hunting Zinogre. From music to his moves it is a battle of epicness. Only game I've logged in 800+ hours and still get that itch to play even after this break i'm taking. Good, Capcom could use the money. Good Game Trash Company weird......I like Phoenix Wright and Monster Hunter (last games they didn't flush down the toilet yet) but I hate Crapcom and they BS business practices probably buy this used that's better deal for me.